Marilyn Quirk, author, at the launch of her latest book, Echoes from the Wild West Coast of Tasmania. Photograph courtesy Rose Frankcombe. It could be said it was inevitable that author Marilyn Quirk would one day write about the very different place in which she found herself living with her family back in 1948. In a sense, she and her family too took a migratory path, from the vast tracts of Western Australia to the mountainous regions of Tasmania, and Tarraleah. Arriving in the highlands, and experiencing the privations of this isolated life during the heavy snowfalls of an island winter and the parching heat and dust of the long summer months, would have been a contrasting experience to a young child used to Western Australia, where Marilyn was born. From these early experiences, at a time in Tasmania, post WWII, when industry was once again gearing up towards full production and there was a demand for power - electric power - hydro generated power - the highland country was the focus of a unique trans-global migration, a place for relocation of the war-weary European men and women, refugees, interspersed with a sprinkling of ten-pound-poms who all came looking for a better life for themselves and their children. Marilyn held that intrigue, about who these people were and why they had come such a long way from their homelands. Once she came to retirement, she could finally seek out the answer to that long-held question about the people of the mountains and what was their story. Out of this quest eventuated Echoes on the Mountain, which includes interviews with some of those who 'lived it', had made the journey across the seas to a faraway and unknown place full of mystery. Mystery in the climate, the geography, the flora, the fauna - and perhaps even the people, whose strong British links to their motherland still flourished in those days. Following on from Echoes on the Mountain came Tasmania, An Island Far Away, a title that says it all. This significant work also contains migrant stories but this work extends itself further than just those immigrants who came to work on the post war HEC (Hydro Electric Commission) schemes. This collection encompasses not only some of those stories but others, dating back to the colonial days of the 19th century. It could be clearly said that, for everyone, other than the native Aboriginal people at the beginning of European settlement in Australia, was an immigrant. 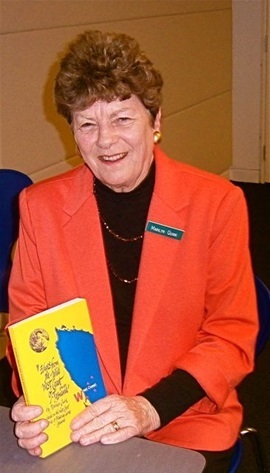 Finally, just to add some spice to her own personal writing journey, Marilyn diverted course slightly, when she was impressed by John Copeland's compilation of stories written about his grandfather, Reverend Frederick George Copeland, for the centenary celebrations of the Church of England in Queenstown in 1998. From here evolved Echoes from the Wild West Coast of Tasmania (1894-1901), a fascinating account of an English man-of-the-cloth and his stoic resolve to bring succor to his scattered flock on the rainy west coast of Tasmania. 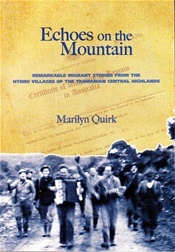 Echoes on the Mountain, by Marilyn Quirk. With the assistance rendered by grants from Arts Tasmania and Hydro Tasmania, these enabled the author to bring Echoes on the Mountain to fruition in 2006. Much leg-work and travel went into collecting the firsthand accounts from the memories of the men and women who had been there, up in the mountain country of Tasmania during the great European exodus to the Southern Hemisphere. People appeared to have come from everywhere - Italy, Poland, Lithuania, Kashubia, Czechoslovakia, England, and it is their stories that are told in this unique way. 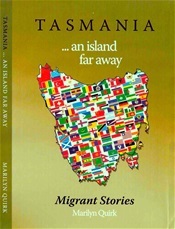 Tasmania, An Island Far Away, by Marilyn Quirk. 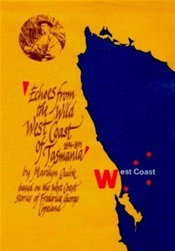 For a slight change of pace Echoes from the Wild West Coast of Tasmania (1894-1901) came about as a consequence of the author reading a compilation of Pa's Yarns, presented by John Copeland, grandson of the Reverend Frederick George Copeland. Reverend Copeland's extensive parish reached from where the wild waters of the Indian Ocean rolled in to the edge of Tasmania, and all points beyond in this quarter-corner of an untamed, island wilderness. From babies' births to dying men, the whole gamut of the reverend's duties were covered, no matter the cost to him to reach his flock. The yarns were arranged by John Copeland to celebrate the centenary of the Queenstown Church of England in 1998. The anecdotes would act as a catalyst for this larger work, where more intensive research ensued to bring the expanded stories to life. Published by the author in 2012, this is a wonderful expression of life as it once was for those men (and women) who chose the life of a West-coaster over and above anything else, and in their time relied on men-of-the-cloth to reach them in their darkest hours.